When talking about Japanese made acoustic guitars people tend to think of Yamaha, Takamine, and Alvarez as being the major brands of acoustic guitars that are made in Japan. Those three companies are the three major companies in Japan that have been and still are making acoustic guitars. But there is also a pretty rare brand of guitar out there that you might run into, and that is the Yamaki brand of acoustic guitar. If you do see one, and it's in playable or repairable condition at all, then I seriously suggest that you buy that guitar if you are financially able to. I've seen exactly two of these guitars ever. I liked both of them very much. I became acquainted with one recently, and couldn't have possibly been more impressed with that guitar. The other one I'd seen once belonged to my grandfather, and I nearly bought it from him at one point. Basically, the two Yamaki acoustics that I've had my hands on both belong to uncles of mine, and one of those uncles at one point or another had owned both of them. I can't speak for how truthful or accurate this next thing is, but the story that I was told was that the way that Yamaki was displayed on the headstocks of their acoustic guitars looked so similar to how Yamaha was displayed on the headstocks of their guitars that Yamaha sued, and had the Yamaki company to change things. Here's what I know for certain, I like Yamaha acoustic guitars, and I consider them to be fine guitars, and especially if you buy one of their L Series guitars. However, I'm positive that the Yamaki guitar I played recently was better than any Yamaha acoustic guitar that I've ever seen or played, in fact, it was a very comparable guitar in quality to the Alvarez acoustic guitar that I fell in love with once at the North Texas Guitar Center, but a fancier guitar. If you know guitars and you look at that picture of the Yamaki acoustic guitar up above, then it's clear that that guitar is a copy of a Martin D 18. You can't really know how good a quality that guitar is from the picture, and while it's hard to tell whether or not it's a solid wood construction guitar, I'm betting that that is exactly what it is. The thing that is most clear from that photo is that the guitar features a spruce soundboard. From the looks of the thing, I'm betting a that it's a solid spruce soundboard, a hallmark of a great acoustic guitar. 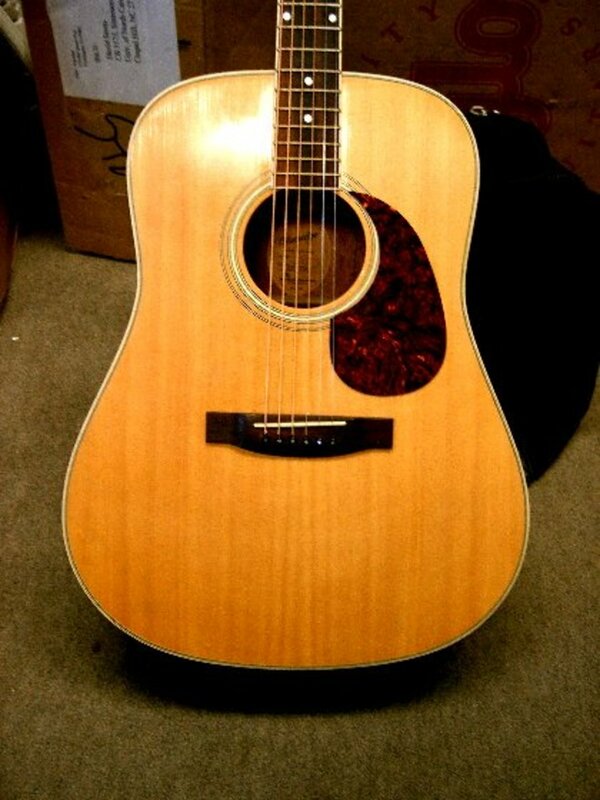 Now, looking at the fine photo above we see an example of the Yamaki acoustic guitar model called "The Yamaki Deluxe." This guitar more resembles my Uncle Tom's guitar than does the other photo, and the reason for this is that the soundboard of this guitar is clearly a different wood than the spruce soundboard in the top photo. The soundboard on the Yamaki Deluxe model is clearly Western Red Cedar, and that is what my Uncle Tom's Yamaki flat top guitar features as a soundboard. If you recall that I mentioned something about having two uncles with Yamaki acoustic guitars, that's correct. My Uncle James owns one as well, and that would be the one that my grandfather used to own. I've not seen that guitar in years: I hope that cleared up any confusion that I might have created. 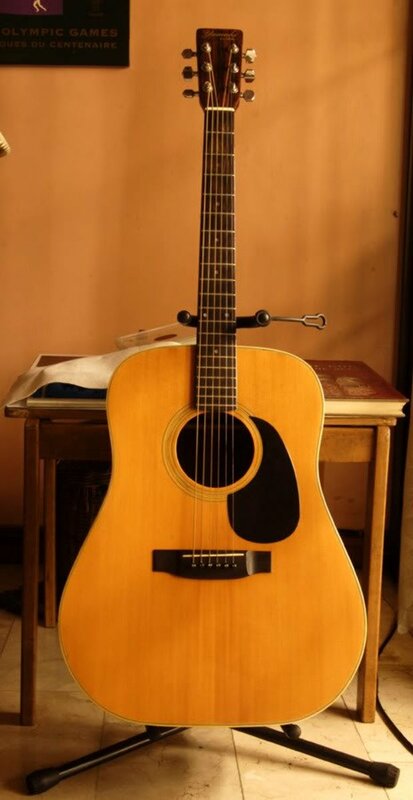 The Yamaki acoustic guitar that my Uncle Thomas owns would more be a "Super Deluxe" or something; it's a more decorated model than the Yamaki Deluxe in the photo above. The sticker that should be visible inside the soundhole of his guitar is absent, but Uncle Tom's Yamaki flat top has an abalone inlay up the fingerboard the likes of which would be seen on a Martin D-42, or a Martin D-45. I've no idea why Yamaki as a company seems to use Western Red Cedar as a soundboard on some of their best guitars. I don't have any problem with it. The very fine Yamaki flat top that my Uncle Thomas owns has what are definitely solid East Indian Rosewood back and sides, a solid Western Red Cedar top, a rosewood fingerboard, and lots of Martin style abalone inlays for fret markers up the neck. It's more than a thousand dollar guitar any way you slice it. Here's the deal about Western Red Cedar as a soundboard and tonewood. It's outstanding for that purpose. I've always been told that cedar wasn't used so much for flat tops because people using a heavy pick attack when playing will tend to overdrive and distort the notes with cedar. So cedar, having more excellent tonal characteristics when played lightly, was most often used for guitars that a fingerstyle player would more likely use. I didn't have that problem at all though, not with the Yamaki dreadnought. I played the thing with a tortoise shell pick, and every note rang loud, clear, and true. Sometime in the late '60s, Daion began exporting Yamaki guitars to America, where they were well received. By the early '80s, however, Daion felt that the Yamaki Martin-style guitars were getting lost among similar instruments from other Japanese builders like Takamine, Yasuma, and C.F. Mountain, so they redesigned the entire acoustic line and started building acoustic-electrics and solid-body electrics as well as oddities like double-neck acoustics. They dropped the Yamaki name and rebranded their instruments as Daion guitars. Daion began an extensive advertising campaign to introduce the new line around 1982, but this was a time when musicians were more interested in the new MIDI-equipped synthesizers than in guitars. In 1984 Daion stopped importing guitars to America and soon went out of business. Yamaki, on the other hand, survived the downturn of the '80s and now makes parts for other Japanese guitar companies. From browsing forum posts and looking at YouTube videos, the consensus among owners and players is that Yamaki acoustic guitars are top notch. I recall liking both Yamaki acoustic guitars that I've played very much. The one I played recently was a superb instrument that would be comparable to rosewood and cedar flat top steel string guitars by C.F. Martin & Co. which sell anywhere from $1,700.00 to $3,000.00 new. The particular guitar that I played could possibly be comparable to more expensive models than the prices listed above if the backs and sides happen to actually be Brazilian Rosewood rather than East Indian Rosewood. I'm mostly certain that that guitar was East Indian, but again, several forum posts seemed to indicate that Brazilian Rosewood was most often or very often used with Yamaki guitars. These guitars are rare, and somewhat hard to find nowadays. If you bump into one at a flea market or yard sale you should definitely grab it. It's either a keeper already, or worth repairing. 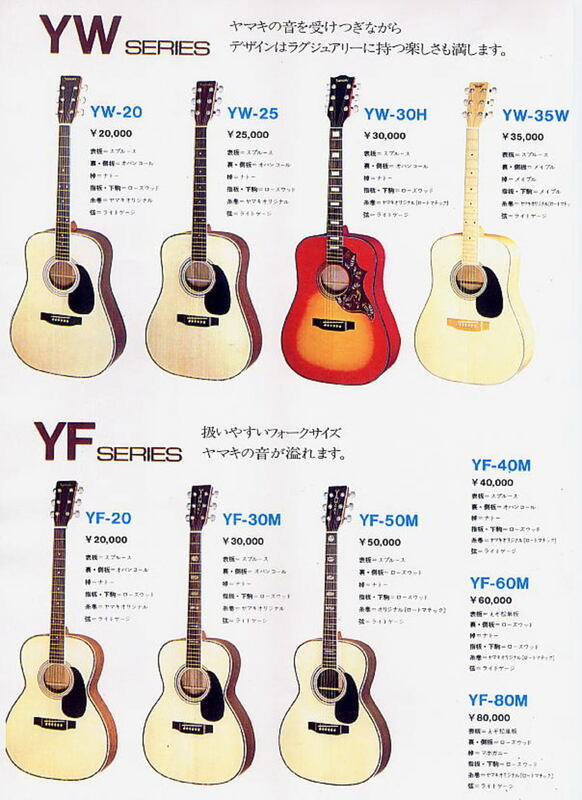 Yamaki Guitar Identification Guide - An Old Advert. I have a Yamaki AY372S Ser #141120. Bought it in 1979 (probably from Long and McQuade Vancouver). I played it frequently for a couple of years until life got in the way. Carried it with me in my van to Toronto and all the way down to Mulege BC Mexico. I didn't play it for 30 years. Then two years ago I pulled it out of the closet thinking "I should sell this". Well, just before putting it on Craigslist I threw some new strings on her. I credit my sweetheart for getting me right back into music. I play it every day now for at least a couple of hours. I have a Martin D28 too but I come back to the Yamaki all the time. It has a voice that, as the old ads suggested, "a singing" guitar. I put D'Addario extra lights (10's) on it. It always cuts through any other guitar in the group I play with. I love it! I would never sell it now. It sounds better and better all the time. Anybody heard of a Yamaki (Custom) Western model A436S? My folks bought it new in 1971, in Victoria BC, with a hard case, and it was rarely played (kept strung, though). Looks like a solid spruce top and solid rosewood bottom & sides. I can't find any references to this model number in the old guitar catalogues and messages below. Wondering if it's worth having a luthier do a couple of cosmetic repairs on the spruce top. It's otherwise mint. I have a AY370S yamaki I bought new in the 70s still playing it.excellent guitar. In good condition. Is it worth anything? I bought a Yamaki YW-40 in Japan back in 1976 and it’s still one of the best guitars I’ve ever played..I simply love that guitar..
Im a touring guitar tech of three decades, and a collector of "lawsuit era" guitars. Was at my local pawn shop today, and caught something different in my glance thru the usual firewood..... Yamaki AY231. Mind Blown. Ive played alot of endorsee guitars over those years, this Yamaki is right up there with them. Incredible sound, with perfect intonation. Very rare to find. New brand in the collection! This has very little hours on it as I gave up to early but kept the guitar. Was always in a hard shell case. Just curious what this might be worth today. Any rough guesses. Do you know anything about the custom line? I picked up a Yamaki No. 125 Custom guitar last night for $50 at a thrift store and the sound is absolutely incredible. I don't know much about it, but I think it is a solid redwood cedar top with what I think are rosewood sides and back (not sure if it is solid or laminate, but the sound is so warm and amazing so I am not too concerned either way). One of the tuners is on its last leg so I am going to try and get them all replaced, but overall I think I found a real gem! I own Yamaki F 118 and love it. I bought Taylor too but Yamaki is another level. That absolutely works, and had I had my head together earlier, I would have thought to say just post the links from CL. Thanks, I am wondering if this link to my ad might work. JAlexander1951. The two ways I know to do this are to post them on Facebook or photobucket. On either site the photos must be set to be public, so anyone can see them. From there you can copy/paste the links to here. I put my F-225 up for sale on CL today for $300. I'll see if I get any serious bites. I wanted to post a couple of pics here but can't see how to do it. If someone can explain it to me I will. Thanks. I have a mid 70's (i think) Yamaki, I will post a pic and serial #, hopefully someone knows something about it! I have a Yamaki AY335S I bought new back in the 70s. It is beautiful in sound and playability. Can anyone give me any info on it? I bought it at North Shore Music on Lonsdale. I was wondering if you might be able to tell me the year of production of a Yamaki AY376S serial number 221106 ? The first step is to find the model number inside. and sides or is it Indian Rosewood? AY470S and a 225 Custom. discover the existence of new "gems". a few bucks to have it worked on. EJ 16s and guess what? It really is a magic guitar. I am a big guy with big hands but man...what a guitar! I feel so blessed to have four Yamaki guitars. Bought and still have my original 6 string from 1975. It will go to the grave with me. Over the years I've been fortunate to purchase three more. Very prized and treasured. I guess part of the issue is Yamaki also made beginner level guitars. 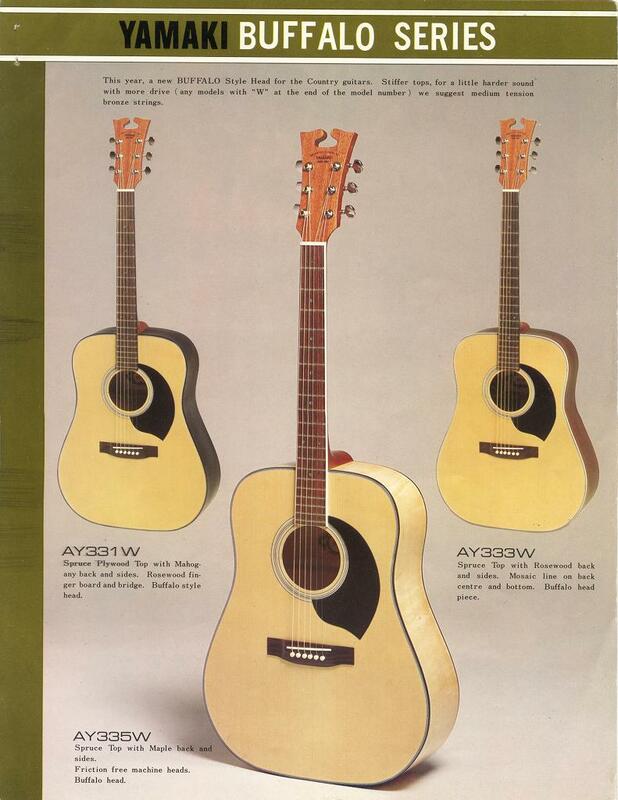 At the time Yamaki was sold in the US, Martin pretty much only produced top notch guitars. So if you only ever saw one of the beginner level Yamaki, and didn't know any better, you'd be like the nimrod. I've seen a cheap-y Yamaki, and a very fine one. I thought they were both terrific. Wes: pls block this nimrod. with a love or curiosity about Yamaki guitars. knock what you don't understand. Did real research on this type guitar. It was mas produced to rebuild Japanese ecconomy after WW2.not Real rare at all. There are plenty around.sold at Woolworths and other stores during the late 50s and cheap.. I have a Yamaki copy of a Martin D-41. It is a very well built guitar and has a good sound. Are you sure that it says Yamaki and not Yamaha? 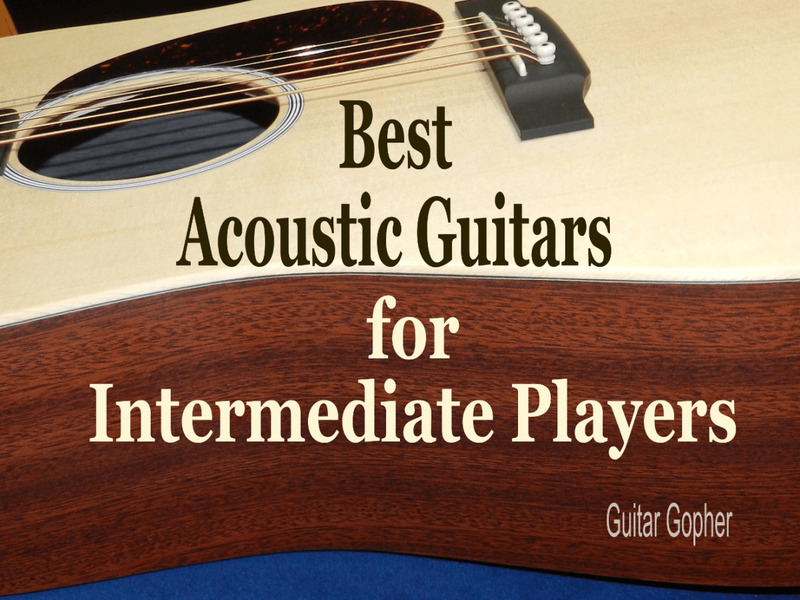 I loved reading the detailed information on Yamaki acoustic guitars. I haven't played one, however, I'd love to get playing a Yamaki. I used to play a lot of acoustic early on. I play the electric guitar more often nowadays. Your article has inspired me to play my acoustic more often. Thank you for the wonderful post. Cheers. I owned Yamaki Deluxe exactly like the one pictured and i traveled all over North America with that guitar. I would have it today but alas due to my own carelessness by leaving it out in a party it was crushed by a drunk. Sounds like the guitar one of my uncles has. Very good quality Herringbone D-28 copy, but with the red cedar soundboard. It's a friggin' awesome guitar. I was given a Yamaki guitar a few years ago and am astounded by the sound. It is a D-28 copy with a Western Red Cedar top and solid Indian Rosewood back and sides. The sound is deep and rich, better than any Martin I have owned or played in the past. The only problem is the action. Pretty high, maybe needs a neck reset. I am a slide player so it works great for me but not for everyone. But because of the action it may not be right for everyone. The neck is the only indication that this may be a cheaper guitar. Top, back, and sides are wonderful, with deep and rich presentation. I inherited a Yamaki W140 from my father, it had probably not been used for 20 years or more when I found it in its original hard case. Although the finish was in a terrible condition the sound of it is simply amazing. I have never heard an acoustic guitar sounding like that, maybe it is because of the finish fading away leaving the wood exposed? I have attached two pictures of it. A note to those who have recently discovered Yamaki. "out there" that are as good or better than a Martin. Just here doing some research on a guitar I just played, a cedar topped Yamaky with mahogany back and sides. This guitar has been sitting in its case for maybe 20 years... perfectly in tune and fantastic action after all that time. What a tone and playability... fantastic acoustic guitar. Yes, it can be frustrating to not know the model, but at the end of the day if it sounds good, I don't really care. I will just enjoy playing them. sure what the "B" stood for. AY470S 12 string - has both Yamaki name and Daion symbol on the soundhole sticker. I usually play the AY331B but I also like the AY333. The 12 strings sound amazing too. Just curious. What are your two favorites? I now have 15 Yamaki guitars. 4 of them are 12 strings, one lefty and one Buffalo. I played a Daion once and I would love to own one. They really ring! a solid top spruce Yamaki is quite rare. I looked up what a V neck is and compared it to all the other styles. I am not an expert but I do believe it is a soft V neck. What is a soft V neck? neck. It's a theory I'm working on. Back in 2001 I was in Vancouver and visited a Pawn Shop and bought a Yamaki 12 String AY 470S. It appears to be a solid cedar top with rosewood sides and back. It is in excellent condition and came with its original wood hard shell case. I paid $300.00 for it back then because it had a very rich full sound. That is all I know about it and can find no other information on this model. Just obtained an ay333b with a solid spruce top that is paper thin - very little scratching on the pick guard so it has little use. I was surprised that there was very little bellying and fret wear. The sound is amazing. The back is Rosewood three layer laminate. Not sure what the middle layer is but an acoustic pickup was installed so I know the middle is a light colour. The 333s models appear to have a truss rod with adjustment at the tuner heads. This one is in the body. I am wondering if the b at the end stands for bone saddle and nut as these look original except for under saddle pickup rework. that would be what they are calling a "harder"
used term "Western guitar" and "a country sound"
If you can post a picture that would help to reveal some clues around this. The "AY" at the beginning of the model # implies that the product was built for export to North America (probably Canada). The catalogue page below (see link)would suggest that yours is a higher end Buffalo series (but that is assumption without actually seeing the style of the guitar). Model numbers in the Yamaki line are consistently higher for higher-end builds within the same style. Notwithstanding that it might be a laminate top, your model # suggests a higher quality than average. Possibly reflected in quality of materials and adornments. I once had a W 115. 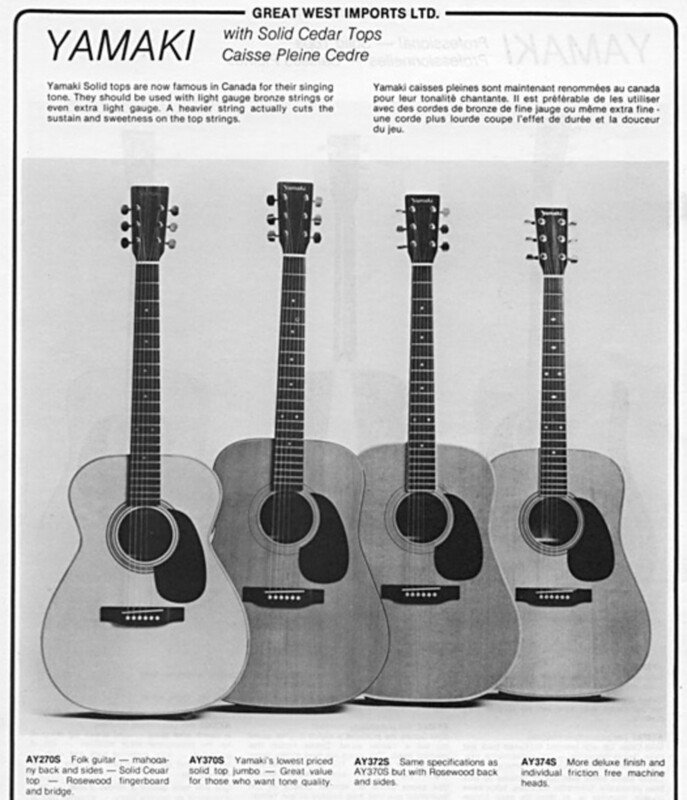 Some older Yamaki guitars were labelled "Folk Guitars". Some of these were solid top and some were laminates. At the same time there were some labelled "Western". be laminates designed for a louder sound. Now there may be a correlation between Western and "W"
I am just starting my research and have been reading all your comments. It belonged to my late hubby. He just loved it!!!! I recently got a really beat up yakami w-15. The neck and fretboard was split near the body and the body itself is in cosmetic ruin. Could you perhaps yell me anything you know about a w-15 and if it would be worth it to refinish it? nice Mr. Mole..they are a steal sometimes!! 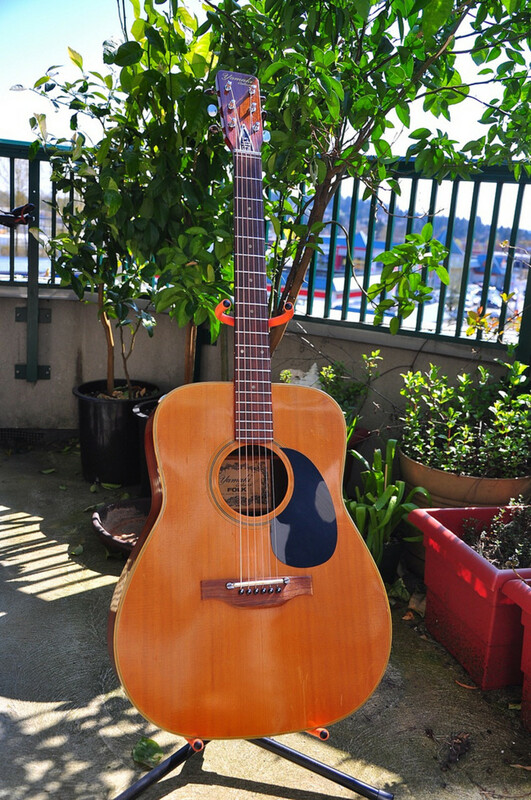 Just found an AY372S in a pawn shop on Vancouver island, for a friend of mine.I am a lefty, if anyone wants to sell a lefty Yamaki, let me know. I paid $251 , reduced from $300 because of fathers day...got original case and a free set of strings. An odd thing i noticed, i couldn't sing / excite a single resonant frequency out of the sound hole. It's an INCREDABLY even toned instrument, early no paper label, with super action, perfect evenly spaced grain on the top, at least 80 year old wood, cedar, perfect frets, fingerboard, low action, and just a stellar player. 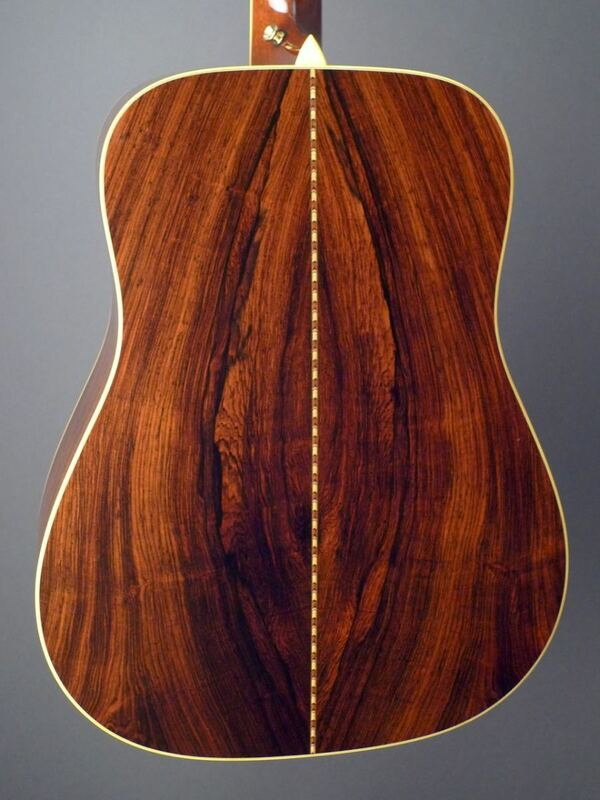 I have,a very high end luthier friend, will check on the brazilian rosewood back thing and post the results....looks like the back AND sides are bookmatched from one original piece..never seen that. The grain mirrors from the center line and wraps around the sides. It looks like a pretty early one. I live in Alberta Canada...most of the Yamakis i see go for around $300.00..I think the people i got the deals from are not players and just wanted to get rid of them..The Daion was in pretty rough shape with no case..The AY331 has a crack on the lower side that doesnt affect the sound as far as i can tell....I love them both and they are my main players..! $200 and at that price there will be something wrong with them. Martins or Taylors) and how they compare. I just bought a Yamaki AY331 B series Deluxe Folk guitar for $50.00 with case..I love it ! it sounds awesome with nice low action..its my main player now..i have been lucky with my Daion 78 heritage costing only $35.00 ..i had to put $100.00 into it to get it up to snuff but it plays and sounds amazing as well...apparently there are deals to be had...patience is all you need..and a little luck! ps..the Daoins site on facebook has a number of knowledgeable and interesting people with a bevy of fascinating instruments made by Yamaki and Daion! with "A" , "B" and "L" suffixes. It turns out that the "L" was a "lefty". guesses one could make but anyone could do that. It is plain to me that some of you folks have superior skills to me in searching the web. I need to up my search game for sure. Thanks again. Here’s a few additional catalogue pages that illustrate some “AY” models the are suffixed with “B” and "D" and "H" and "T". These are Daion branded guitars that were built by Yamaki. I don’t see anything obvious in the specification sheet that would imply “B”. One thing is for sure… it does not imply lesser quality. I own an AY078H which is shown in the 2nd link. I wrote about it in an earlier post in this blog. The B 30 was, in fact one of the ones I saw. would be a foolish jump to take. Thanks for the links, Chase! I'm still on a mission to try to figure out what the heck "Deluxe"
that have the letter "B" as a suffix. Anyone know the meaning of that? I installed a JLD bridge doctor to help stabilize the bridge and to help straighten out the top then I put a new set of Elixir polyweb 10-47 strings on and tuned to D. Wow what a nice sounding guitar, I really like the sound and it is easy to play, easier than the Takamine F400s I bought recently. I am beginning to see why you people like the Yamaki guitars! I'm hooked, I guess I'll be on the lookout for another in nicer shape maybe? Thank you for the replies! 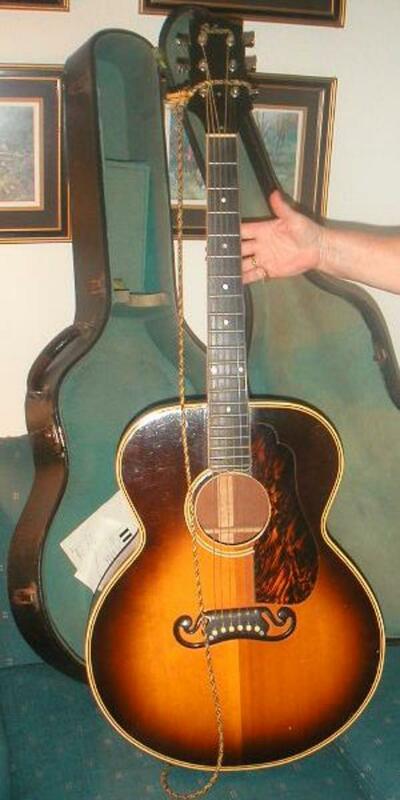 Mine does have a 0 fret and it is Indian rosewood back and sides. The back is interesting in that it is book matched but does not have the usual strip down the center on the back as most of the models do in the catalog reference above. It is supposed to be a 1972 model. Other than the bridge problem and top bow and concave it is a pretty solid guitar. The neck is straight and the strings are about an eighth of an inch at the 12 th fret so it is easy to play and it does have a very nice characteristic sound. I am anxious to get new strings on it to see how it really sounds. If I knew how to post picks I would. All in all I'm happy with it for $160 plus reasonable shipping. the photos that Chase gave up disproves the second digit theory. have one currently. It is a W 115 deluxe. zero fret, a laminate top and a mahogany back. Basically a higher-end lower-end guitar (if that makes sense). So, thank you for posting. We may have learned something today. I am going to go out on a limb and say your guitar is uncommon. I went through all the catalogue pages I have. Only saw 2 references to 'W' models. One was a maple version so I don't think it applies here. Is your guitar anything like the W120 in this link, notwithstanding 6 string? I just received a 12 string deluxe Yamaki folk deluxe 1972, model number w 128 or 6? I can't find it in the catalog here and there are no other numbers inside. Can anybody shed some light on this model? Your AY379S is probably a decent guitar. one is a solid top and the other a Deluxe (ie. laminate). top. If anyone has evidence to the contrary please let me know. I have yet to figure out what "Custom" implies. I recently inherited my father's AY-379s. It seems (to me, at least) to have developed a richer sound over the years. I believe he bought it in the mid 70's. There was a music store in a small town west of Ottawa, Ontario which sold a lot of them. He would take this instrument to parties and jam sessions and trade it around with other pickers. He said he played a lot of Martins at those gatherings and he, as well as many of the Martin owners, found the Yamaki to be every bit as good. I used to have a similar Yamaki, a somewhat lesser model, which was destroyed in an accident... I still have the parts, and a skilled luthier might be able to do something with it. By coincidence, my son had an old Yamaki, one of the ones with the funny looking head, given to him by a friend who said she never played anymore. It's in pretty nice playable condition as well. I'm working on a Seismic Vessel and I found a Yamaki Acoustic 6 string down stairs, not sure what type, I have the number from the inside XW30M then underneath it has 140202, it is a beautiful playing guitar, I wonder how much it would cost to buy one for myself? 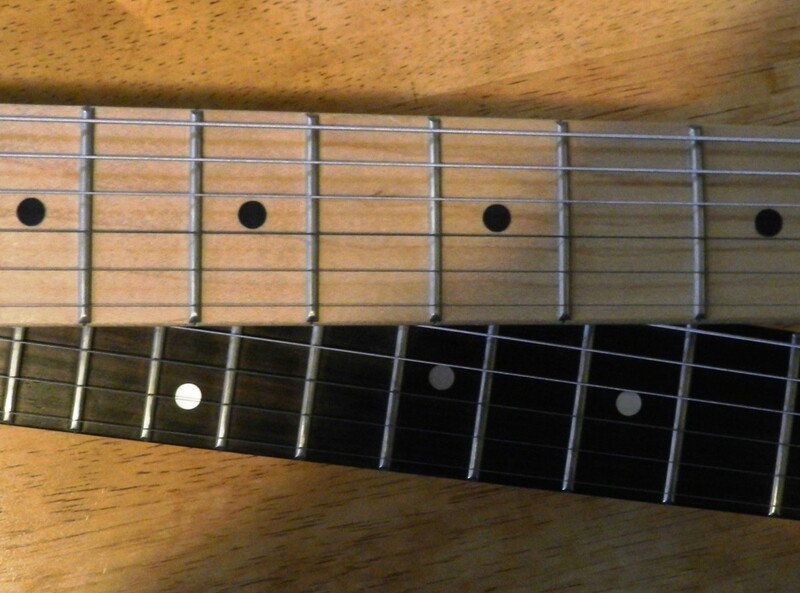 the wear on the actual frets (usually in the first five frets). to a particular buyer. Most often $350 is the max . welcome to supplement this "analysis". as either way it usually narrows your "customer" field. series. Now I don't recall if that was considered a fact or a theory. to add the "Y" to simply indicate Yamaki. I know of one fellow with an A333. is an AY339S listed in the catalogue. pattern (ie. nothing in the 1st fret). Always glad to talk "Yamaki". Yes there are many different models prefixed by many different letters, but anything other than an "AY" in North America is rare. Those would likely have been brought across the pond (from Europe or Pacific rim). This is directly linked to specific companies having distribution rights for those areas. One could basically say that "AY" means "built for shipment to North America". If you see a non "AY" model for sale on eBay, most often the seller is in Japan. I own a Yamaki model A339 (not AY) that is also solid Cedar top with 2-ply rosewood back & sides. I bought it second-hand from a guy in Toronto in 1985. A real D28 knock-off if ever there was. In my years of research I have only ever come across 1 other of the same, and that was a result of this blog. A woman very near to my location has one in even better condition than mine. I cannot say for certain, but I am of the opinion that both hers and my A339 were brought here as samplers to promote the Yamaki name in N.A. before the "AY" production began. In all the catalogues that I've combed through, there just isn't an "A" model anywhere. The reality of Yamaki quality (relative to price-point) is actually indicative of a more widespread reality of the era in which they were produced. Japanese luthiers typically were generational, having been exposed to their elder wood craftsmen through the decades. Earlier generations were extremely skilled producers of violins, and when the acoustic guitar acquired wider popularity in the 50s & 60s, younger craftsmen began focusing on guitar production. The master skills coupled with a cultural attention to detail and quality that Japan was renowned for in the 60s to 80s, has led to this upsurge in interest about Japanese produced guitars from that era. Unfortunately, the business model was not sustainable vs mass production combined with cheaper labour costs out of China. those old catalogue pages as well. Plus the "S" suffix on the AY models. had a surprisely good sound and volume, relative to the market value. I have a Yamaki AY 337 S. I do not play it but bought it from a customer at her garage sale. It is in phenominal shape and always wondered how much it was worth. I had a guitar player tune it and it sounds great!! There no definitive answer for knowing if a Yamaki has a solid top, except if the model # starts with 'AY'. Any 'AY' model that ends with 'S' (e.g. AY476S) is a solid top. The 'AY' models were imported to North America by a now defunct import company called 'Great West Imports'. In fact, any AY model that ends with 'S' is often solid Canadian Cedar. But there were many models of Yamaki that never made it to N.A. Other distribution companies had exclusive distribution rights to other areas of the globe. Daion Co Ltd was the domestric distributor (they of course also had Yamaki make many guitar models as Daion). Great Music Co. Ltd held distribution rights to many other areas including Europe. In many cases the text on the pages of these catalogues is Japanese, so that is still problematic for most. Rule of thumb: if there isn't an explicit reference to "solid" then it probably isn't. Another clue would be the relative price of the product line. All the higher end models are solid top. At the highest end of the product lines, often the models are solid top & body. Very difficult to find any of those in North America. for sure if the top is a laminate or a solid? Hi there, I have a Yamaki guitar and am trying to find out more about it. It is a Joodie (6 string) and is a lovely looking instrument with a gorgeous tone. The frets are decorated with six Mother of Pearl inlays as is the outside edge of the body and inner rim. The model number is YW40M and was made in Japan by The Yamaki Musical Instrument Co. Ltd. Can you tell me more regarding age, value etc? Please let me know if someone has information about the YM400 is solid top or completely solid and how much does is worth now. Or just information about the YM series. Thanks a lot. Hi everyone.. I own a Yamaki Model No. AY232 which I haven't seen anyone mention nor talk about. It looks like a Martin D-18.. it's a beautiful and amazing sounding guitar.. Honestly I've played on pretty much every expensive guitar you'd think of.. But this yamaki is unbelievablely comfortable.. Best guitar I've played on with the pick N' flick technique.. Played on the John Mayer OM Martins.. It's as good but old I swear.. I need more information about the guitar because I couldn't find anything about it online. There is a number on the sticker insid the guitar right above the model number of the guitar which is"00694060" . Any info would be truly appreciated. It's possible you have a guitar made by Yamaki for DAION as part of the "Year" series. There were 2 models representing 1978: "The 78(C)" (C=Century) and "The 78(H)" (H=Heritage). These were exported to North America as "AY078" models. Check the catalogue page at this link to see if yours looks like either "The 78(C)" or "The 78(H)". I acquired a AY078S (Heritage) a year ago. (In the "AY" model #s, the "S" indicates that it has a solid top.) It is beautiful to hear and see. Stunning solid maple binding on body, neck, and rosette. Brass (yes, brass) nut, saddle and dot inlays. The tone is incredible. Best bass response in any guitar I've played or heard. A real collectible! Just this past Saturday purchased an AY078s at a garage sale for $10!!! It is in very good condition. A few small dents and scratches, sounds simply amazing! I had no idea what this guitar was, just that it seemed to have a solid top and I was willing to pay $10 for solid top! It has Yamaki on the back of the headstock and no sticker inside. just the model and serial #231027 Anyone have an idea what year this would be? I have had a Yamaki AY377S since the 70's. ANyone know how this differsm from other AY series Yamakis? Soes anyone know where i can find the serial#?